Beam Reach | Who will you meet? At Beam Reach, you’ll get to know your teachers and classmates very well. There’s nothing like living together on a 13 meter-long sailboat for weeks at a time to build camaraderie! Beam Reach faculty are PhD-level experts in biology, physics, and oceanography. Our captains are certified by the U.S. Coast Guard. All our instructors are talented teachers. Your Beam Reach classmates will mostly be advanced undergraduates (typically juniors or seniors) from U.S. colleges. Many will be biology, psychology, or environmental science majors. Some will come from other countries or be recent graduates. You’ll also make friends with students taking other classes at the Friday Harbor Labs — commonly in genetics, cellular biology, or intertidal ecology. You’ll also meet other experts from around the region. Guest experts enrich the curriculum with lectures and through collaborative research at sea. Dive deeper: Where will I live? Robin is a lead instructor during the land and sea components. She has a PhD in Biology from Harvard University and specializes in geobiology and biological oceanography. 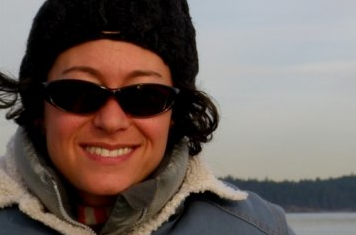 Her post-doctoral fellowship (University of Washingotn, 2008-2011) focused on using comparative genomics and metagenomics to understand phytoplankton diversity and bloom dynamics in changing environments, like the San Juan Islands. Robin enjoys helping Beam Reach students explore the Salish Sea ecosystem — from plankton to whales. When she’s not teaching science on sail boats, Robin can be found kayaking in the San Juans, skiing or climbing in the North Cascades, riding her bike, practicing yoga, or dreaming about sailing around the world looking for her favorite phytoplankton. Val is a lead instructor during both land and sea components. He has taught with Beam Reach since the first program in fall, 2005. He has a PhD in physics, taught physics and environmental science for 35 years at Colorado College, and maintains a fixed array of hydrophones called OrcaSound at his home on the west side of San Juan Island. His students have utilized hyrdophone arrays since 2000 to study orca vocalization and localization. When he is not analyzing killer whale sounds or underwater noise pollution, he is typically at the helm of his sailboat listening to his daughter Laura’s music. Todd owns the 42-foot catamaran that is home to Beam Reach during the sea component. He serves as captain and instructor during the sea component. He often guides ecotours in the area through his charter company Gato Verde Adventure Sailing. He has a USCG 50 ton captain’s license with sailing endorsements, broad knowledge of the local marine environment, and experience as a sailing instructor for the National Outdoor Leadership School (NOLS). Scott instructs during the land and sea components and was a lead instructor in fall, 2005. While earning his PhD in oceanography, he dived in the Alvin submersible to the bottom of the Northeast Pacific while studying hydrothermal vents. He has extensive experience in marine and boat-based education, having taught undergraduate field courses on land and afloat. He drives a car that burns 100% biodiesel and enjoys building and sailing innovative boats. Living together on a sailboat, at a remote field station, and on an island makes for life-long friends. You’ll get to know your Beam Reach shipmates really well and you may even get some advice from our alumni. Past students have come from as far away as Puerto Rico and Australia. Most have been majors or recent grads in biology, environmental science, psychology, or political science. All have been passionate about killer whales and ocean conservation, and have been eager for the challenges of studying bioacoustics and learning to sail. Jason was a lead instructor with Beam Reach from 2006 through 2010. He has a PhD in geography with research experience in elephant bioacoustics and animal behavior. He is especially interested in the overlap of bioacoustics and conservation biology. He is a resident of the San Juan Islands and was once a kayak guide in the area. In 2011 he joined SMRU and plans to enrich Beam Reach courses with news regarding marine renewable power and the mitigation of its potential acoustic impacts on ocean life. Rachael Griffin (BSc Marine Biology) is an independent researcher and photographer located in Victoria BC Canada. A graduate from the University of British Columbia with a Marine Biology Major she specializes in whale research, bioacoustics, and wildlife photography. Her experience includes documenting bottlenose dolphin signature whistles in Mexico, determining significant changes in a solitary false killer whale to recognized acoustic signals, discovering new offshore killer whale calls, Luna stewardship and revealing his calls, vessel effects on killer whale behaviour, and recording ambient sound levels. She recently contributed to the development of the BeWhaleWise Guidelines, co-authored the paper Killer Whales are Capable of Vocal Learning, and is developing a online killer whale call catalogue. The boundary waters of the U.S. San Juan and Canadian Gulf islands, known as the Salish Sea, are one of the highest density whale-watching areas in the world. The boating traffic is high in the peak whale-watching season of May–September, not only for watching whales but for other activities such as sailing, kayaking and fishing. The Whale Museum’s Soundwatch Boater Education Program was created to respond to that traffic and its effects on marine species. Known primarily for educating whale-watching boaters, Soundwatch also patrols the boundaries of marine protected areas, such as National Wildlife Refuges and Bottomfish Recovery Zones, and conducts bird surveys. The Soundwatch boat is also used for responding to strandings of marine mammals. You’ll also probably cross paths with Beam Reach staff and advisors — either through the admissions process, or in person during your program.